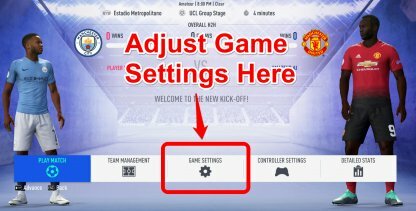 Learn to adjust settings to help you play better in FIFA 19! 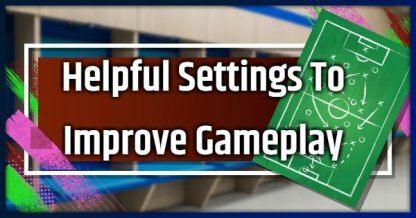 Minor tweaks to some settings can have a big impact on how well you will be able to play the game, & score more goals. You can change your settings to help improve your gameplay. There are settings that you can tweak just a bit to provide more information, better control, and more! You will be able to adjust Game Settings before the match under Game Settings, and during the match in the pause menu. Tele Broadcast gives you a slightly wider angle while still keeping the action close. This gives you better vision around the field. This helps you maneuver around defenders and avoid getting trapped! Custom Camera Settings lets you adjust the angle, height, and zoom of the camera for better viewing. It is recommended to change the HUD from "Player Name Bar" to "Player Name & indicator". This lets you automatically lets you know who you are controlling. By knowing who you are controlling right away, you have more time to assess the situation. This includes whether you can dribble around defenders, pass to another player, or even go for the goal! 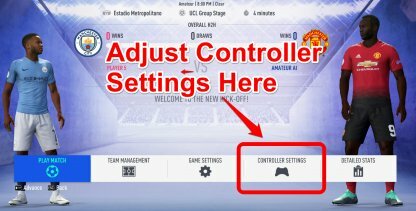 You will be able to adjust Controller Settings before the match under Controller Settings, and during the match in the pause menu. * These recommended settings are not recommended for beginners. Turning Pass Assistance to Semi or Manual will be able to give you more control with passing the ball. However, turning this to Semi or Manual is not recommended for beginners. FIFA Trainer is a handy tool for beginners that shows you different button commands, and indicators to where your pass is going. However, at times it can distracting the game. This can be turned off in Controller Settings.